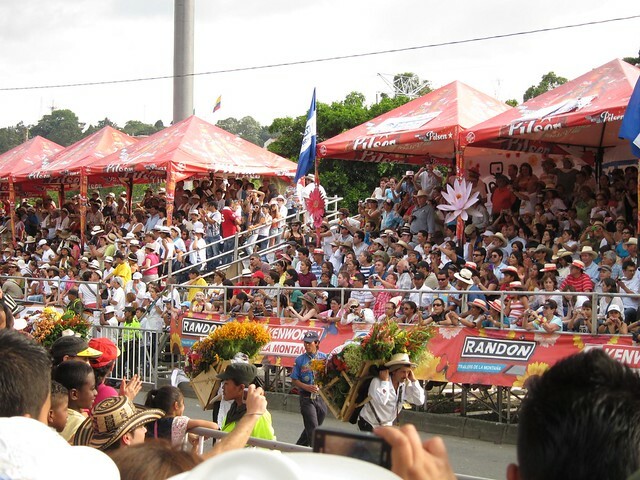 La Feria de las Flores began with Desfile de Silleteros (a flower parade) back in the 1950’s, and slowly evolved into a 10-day affair with a myriad of events and parties to suit every paisa in Antioquia. 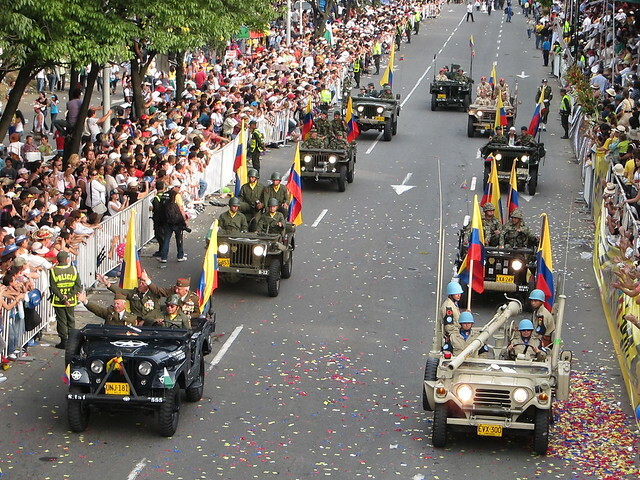 Normally held on a Saturday, the 2010 flower parade took place on the last Sunday of the festival so as not to conflict with the swearing-in of Colombia’s new president, Juan Manuel Santos. The flower displays are called silletas. The best designs are awarded prizes each year. I met up with Troy, Christine (husband Drew, and baby Cole) at a metro station close to the parade route. We were roughly on time for the start of the parade around 2:30 pm, but in no way did we take into account the fact that people were gathering hours ahead of us. Carrying flowers in the parade does not look easy. At least it was a cloudy day, otherwise the strong sun would’ve made it that much harder. When we got as close as we could to the parade, we were still far, far away from being able to see anything that was going on. Not only was there a street between us, there were two thick rows of people standing on their tippy toes as well. Troy and I wanted good photos, while Christine and Drew wanted footage for a video documentary they were working on. When one of Los Silleteros turned in a circle, I was lucky enough to get this photo of the flower display. 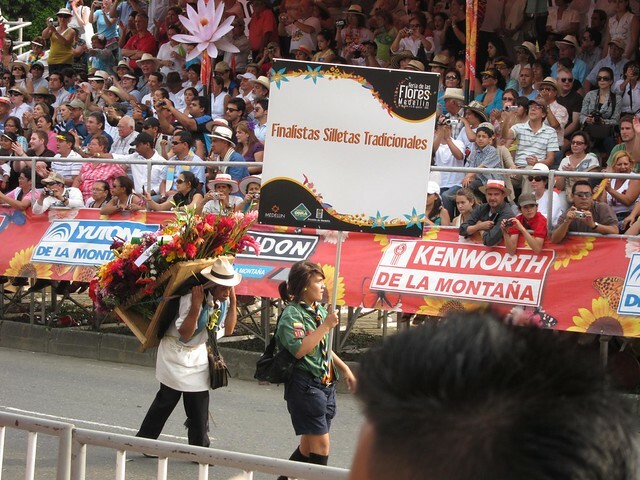 The main draw of the flower parade are the flowers, of course. In Medellin, large, fresh handmade floral designs attached to wooden frames are carried on the back of men, women, and children of all ages. 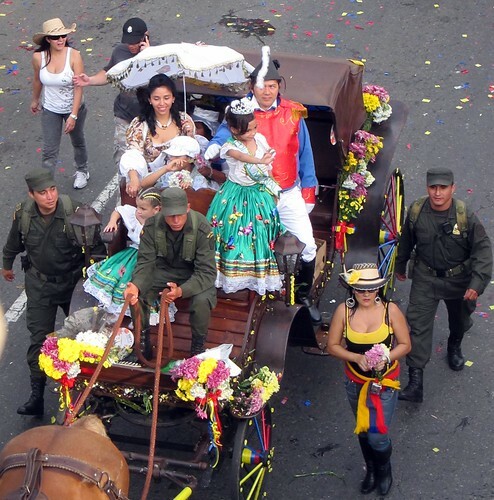 The people carrying the flowers are known as Los Silleteros, and their foreheads bear the burden of this task. Couples dance in the street while others climb trees for a better view of the parade. 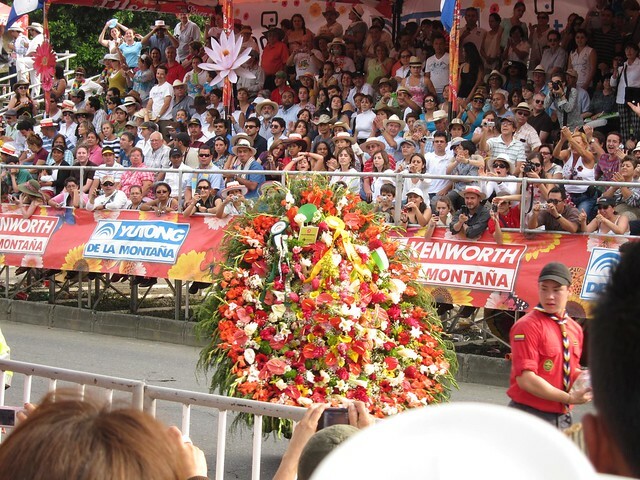 The manner in which these large flower displays are carried is reminiscent of the way sherpas in Nepal carry heavy loads up the mountains. I felt some empathy for them, however at the same time, I had a feeling it was a source of great pride to walk in the parade. View of the parade route from atop the bridge. After standing around for awhile, Troy suggested we do what it takes to get good photos. Troy, Drew and I then proceeded to duck under a tarp fence, which gave us immediate access to the blocked off street that ran parallel to the parade. Now we were getting somewhere, but there were still a lot of people between us and the parade. The smart ones had climbed up trees to get a clear vantage point. 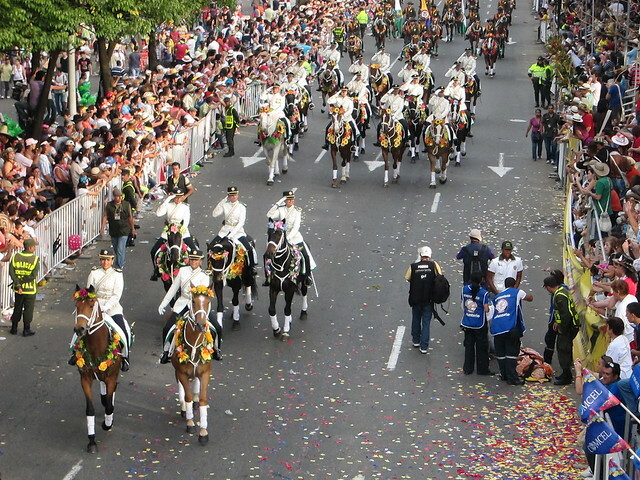 A marching band and women wearing the colors of the Colombian flag. As we walked, and occasionally stopped to jockey for photos, we met Robert, an American who was also trying to capture the parade on video. He joined our crew, and we continued onward. Despite our best efforts, uninterrupted photos of the parade were hard to come by, so Troy and I turned our focus toward the pedestrian-filled street we were on instead. 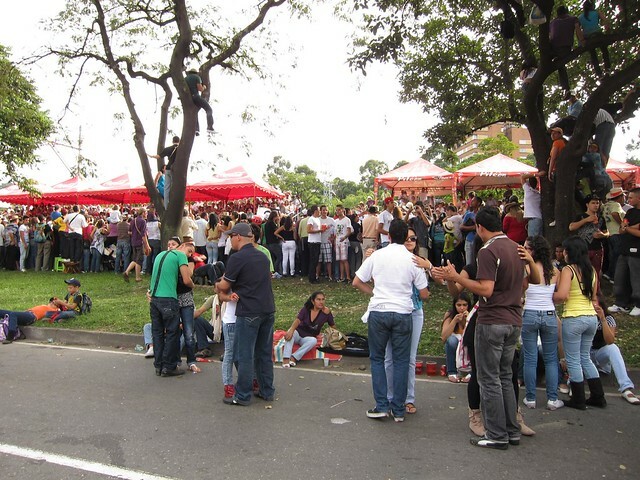 The atmosphere was as festive as La Cabalgata and Carnaval in Barranquilla, with vendors selling drinks, street performers entertaining for money, and people dancing when the music called for it. 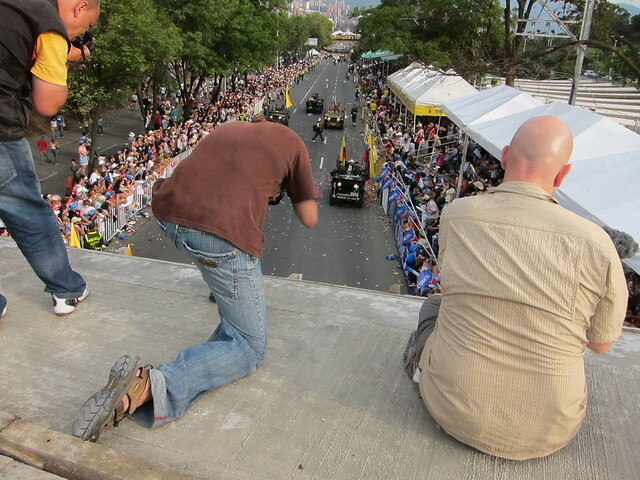 Troy (left) and Drew (right) taking advantage of our good views atop the bridge to photograph and video the parade. When we’d reached the intelligence building, it appeared we were near the end of the parade, so we doubled back to rejoin Christine. Close to where we began, there was a bridge over the parade route which was under construction. Troy noticed a video crew up there, and before I knew it, we were talking to a young army guy about accessing the bridge to photograph the parade. It didn’t hurt our case that there was roughly $15,000 in camera gear being flashed between the four of us. 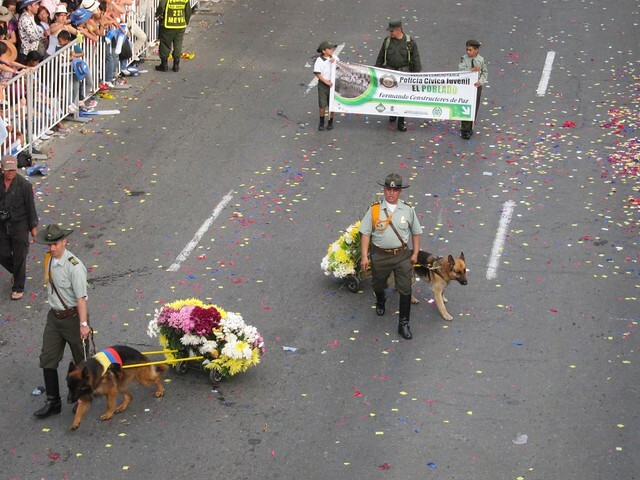 Police dogs pulling custom flower carts! Atop the bridge, we had the perfect views we’d sought the whole afternoon. We snapped photos like crazy, and heard the occasional call of “gringo” from the people in the stands below to our right. At one point, Troy egged them on by trying to get a competition going between the Colombians on the left side of the street, and the ones who’d paid for bleacher seating on the right side (the approach I’d recommend). Military on horseback, as a woman who may have been suffering from exhaustion is carried away on a stretcher (right side). The sun was once again setting as a parade for La Feria de las Flores concluded. 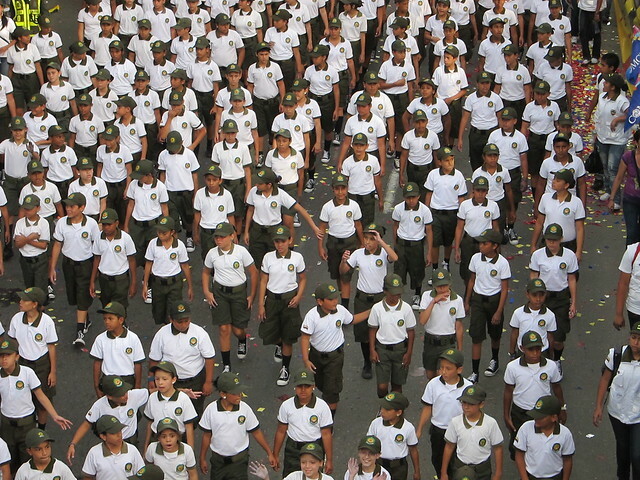 A large contingent of what appeared to be the Colombian vesion of the Boy Scouts. 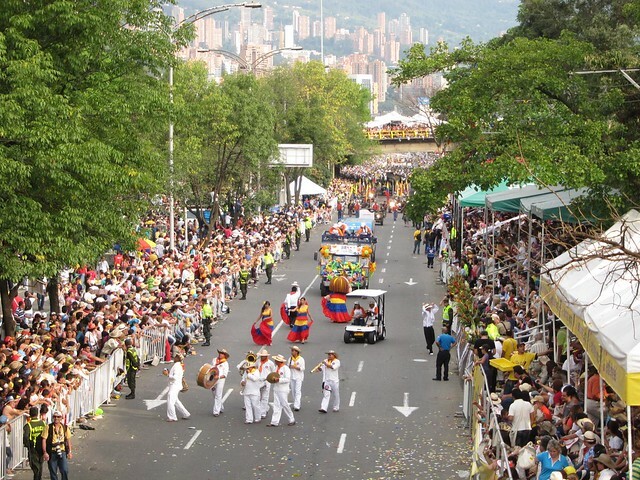 The whole festival turned out to be a wonderful experience, and display of traditional Antioquian culture. I highly recommend checking it out if you’re in Colombia, or this region of Latin America in late July/early August. A future contender for Miss Universe? good post what looking for something like that since some times ! 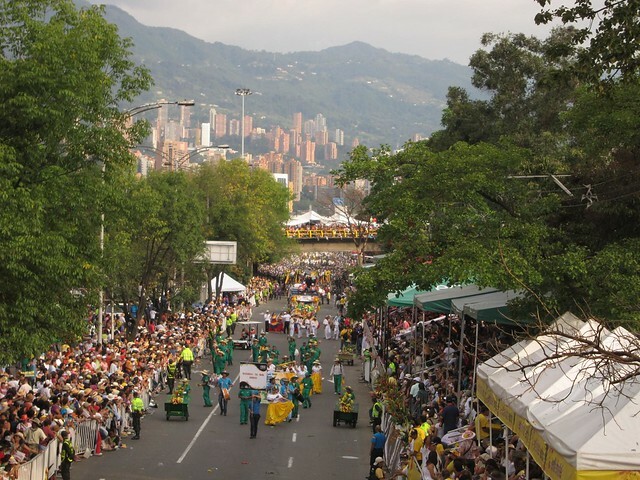 The Ferias de las Flores finish with the flowers parade because Medellin is recognized by have different kind of flowers. 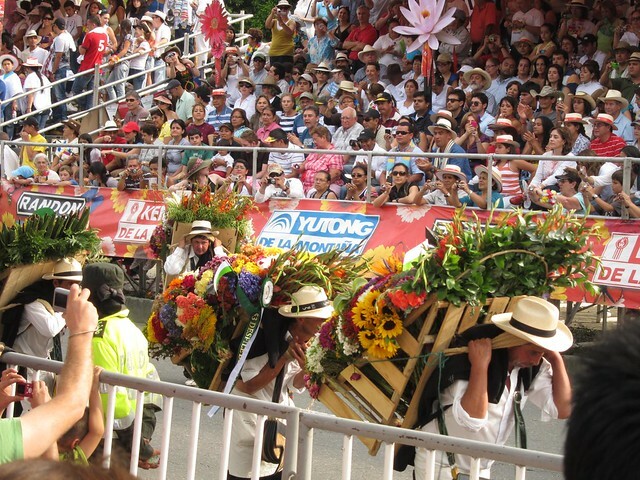 it parade is wonderful because The people carrying the flowers are known as Los Silleteros, and their foreheads bear the burden of this task. also because the people dance in the street and climb trees for a better view of the parade. i feel pride of my city because it has a climate incomparable and its women are beautiful.